MODULAR HOME BUILDER: Can a Japanese Modular Home Builder Do It Better? Can a Japanese Modular Home Builder Do It Better? 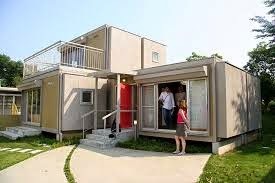 Japan's modular/prefab housing industry is not only alive and well, it could teach us quite a bit about producing high performance homes for the next home buying generation. They have always led the way when it comes to automation especially in automobile manufacturing. That same automation, which is embraced by just about everyone in Japan, produces some of the nicest homes I've seen produced anywhere. Sekisui Heim Homes, a division of a huge chemical company, is just one example of how far ahead of us they are when it comes to producing seismic safe, fire resistant and net-zero homes. This video is in Japanese and is over 10 minutes long but it is worth watching to see what will be offered in the US if they ever decide to open a factory here. A couple worth noting. First they ship everything on flat bed trucks and the width of each unit appears to be about 8'. Also they don't have to unfold their homes in order to do this. Enjoy the video. English subtitles! Let the Japanese come and try to take our modular industry just like they tried to take over our car and electronic industries. We'll send them back with their tails tucked between their legs. Same thing for China. Do they really think they can come over here and take our manufacturing base away from us?